Steve is professor of Lighting and Visual Perception at the University of Sheffield where he leads the Lighting Research Group. He joined the School of Architecture in 2005 following lectureships at Sheffield Hallam University, Robert Gordon University and UMIST. Steve devotes a large part of his time to working with PhD students. To support the international community of PhD students in lighting he set up two initiatives. The LumeNet research methods symposium is an opportunity to gain critical feedback from international leading researchers on proposed experiments before the experiment is conducted. BrightLights encourages PhD students to meet and interview established researchers; it is an opportunity to ask about their work, their inspirations, and a chance to make friends. 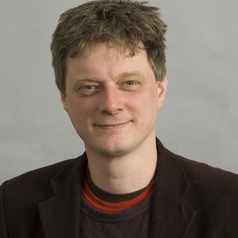 Within the wider research community, Steve is Associate Editor of Lighting Research & Technology and Associate Director of Division 4 of the CIE.
Steve’s research has two themes. His work on Lighting for Pedestrians aims to establish credible empirical data showing how outdoor lighting can be optimised for pedestrians, and this work has led to new international guidance and changes to British Standards. His work on improving methods for quantitative subjective evaluations has demonstrated causes of bias prevalent in experiments of spatial brightness and discomfort due to glare: he recently demonstrated that the Kruithof curve, widely cited in design texts, should be radically redrawn.